At the begining of May I was lucky enough to get to see the finest single A stadium that I have seen to date. That is Parkview Field in Fort Wayne. This stadium is by leaps and bounds a better ballpark than any other single A stadium that I have been to. That list is still short, but I can’t i magine many better than this. The park looks like it could be a Triple A ballpark very easily. They have done a lot right with this park. One of those things has to do with the seating arrangements. Pick a way that you would like to see a ballpark and they have it. You have the normal stadium seats, pinic tables, a lawn area, lawn seats (not the same because they are built into concrete tiers with grass on top to sit on), and suites. This place has it all. I sat in the second row on the first base side, and had a great view of the Fort Wayne dugout while watching the game. No more hidden players. This could be looked at as both a positive and a negative I guess. Another shocking thing about the stadium was the bathroom smell. It smelled like fresh paint, and not underpass hobo. I know the stadium has only been open a month or so, but it is refreshing not having to hold your breath in the bathroom. The stadium has no shortage of picnic areas. Both the first and third base lines have a nice picnic area near the foul poles. They also have a new take on the lawn seating philosophy. They have constructed concrete tiers with grass as a seat. These are not your normal everyday seating in the lawn. The stadium is fairly easy to get to, and the parking is affordable. It was only $4 to park just across the street from the stadium. Right now they are busy building the surrounding area to the park up, so it takes away a little from your overall view as you walk around the stadium. It also makes it a long walk around the outside of the park. One feature that I really enjoyed about the park was the fact that they have the batting cages for the players on the concourse. If walk down the right field line you will run into them. 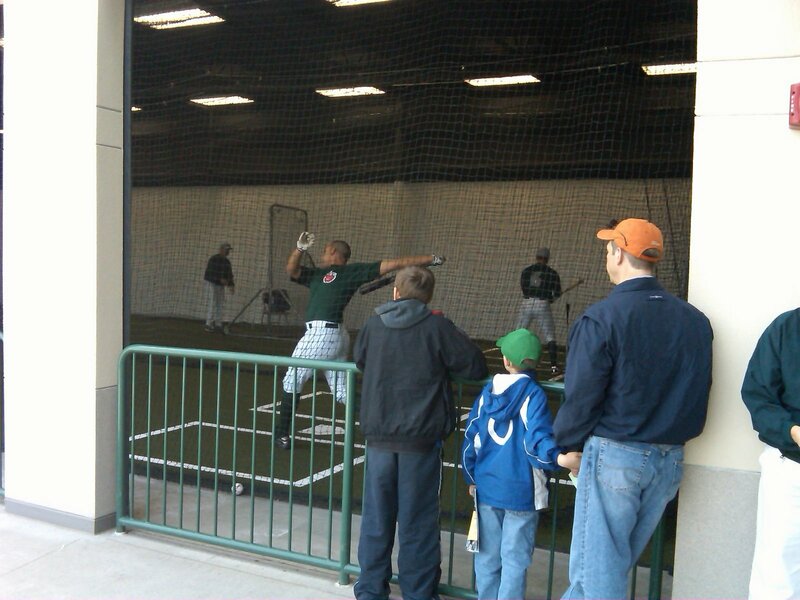 It was fun watching the kids eyes get big watching the players get their swings in before the game. The picture on the right shows one such family watching a Tin Cap get ready. Once the players leave the area kids can pay $2 and take some swings themselves. Another cool feature of the park is the menus at the concession stands. They are not the normal jumble of letters put together on the board. They have nice LCD screens that seem a little over the top, but it did give me something to talk about. As usual the focal point of the guide centers around the scoreboard. This can make or break a game. With this being a new stadium you would expect a great scoreboard. It does not dissapoint. It is not even in the ballpark. It is attached to a parking garage that is located just outside of right field. The board gives you the linescore, the lineups, a great amount of detail of each batter, and even replays! It is really nice to be able to see a replay at a minor league stadium. Unfortunately with only two umpires on the field for Midwest League games this may cause some issues with the umpires. As you can see it has been done in such a way that is matches the rest of the stadium. 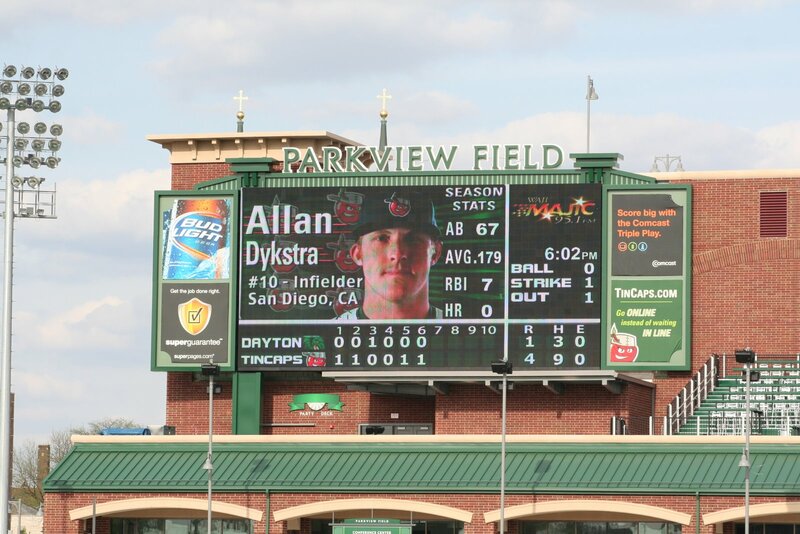 The one thing that they do not do well with the scoreboard is announce/show the pitching changes. This makes keeping score a little harder if you don’t know both teams. They do encourage keeping score by handing out free programs with scorecards. Lots of families were keeping score on the gorgeous day that I was at the park. This is a beautiful stadium that is not too far from here. Being in Fort Wayne it is not really to bad of a drive from most parts of Indiana. If you can make it to a game here I would suggest that you try it out. Left Field Fence: 336 ft. This entry was posted in Fort Wayne Tincaps, Midwest League, Minor League Baseball, Stadium Guide. Bookmark the permalink. Ditto – I agree! Parkview Field really is wonderful. It's truly a park like setting and makes for a fantastic experience. 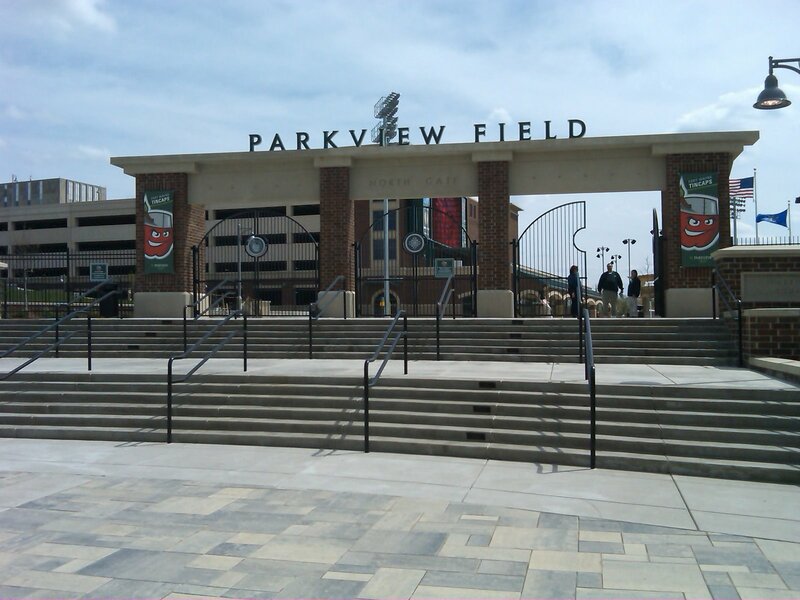 Parkview Field has the best traits from ballparks around the country! Nods to Fenway's Green Monster and Wrigley's rooftops & bleachers make for a great equation in Fort Wayne! Maybe there are a few more baseball fans in the world now!